Prepare yourself....It will be LEGENDARY!!! We were informed moments after I said "expecto patronum"
that it was not, in fact, a statue of Dumbledore. My luggage didn't make it. I was frustrated with the lack of customer service. The people who were suppose to meet me arrived in time to meet the rest of the group but not me. I was sweaty, cranky and overtired. The people who were suppose to meet the rest of the group finally arrived and I was making small talk. Antsy small talk. After more than year I saw Jamie. I actually stopped mid-sentence and took off. I had already warned the person I was speaking too that this would probably happen. He seemed to take it well. We ran to each other like movie couples run at each other on a beach. There were tear and an epic hug. 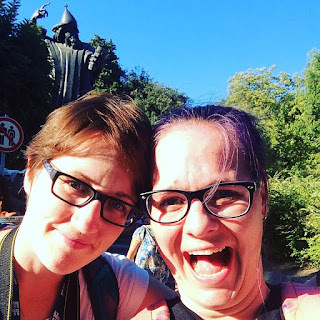 We ended up in Croatia because Jamie is a superhero aka a high school teacher who believes students should be afforded the opportunity to travel. Because of this she earns points with the company she uses and can then trade these points in for discovery tours. She calls it time-shares for teachers. So she traded in some points, asked me to be her willing accomplice and Croatian Shenanigans happened. I will first say Croatia was never a bucket list destination for me. It was more a, if given the opportunity I would check it out destination. And of course now I'm all "everyone must visit Croatia it's such a cool place!" 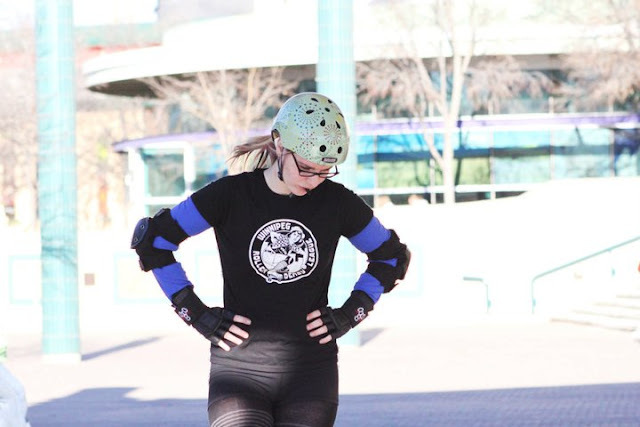 You too can own that awesome roller derby shirt! Jamie and I were part of a larger group of educators from Canada and their partners/other halves/companions. We were shocked when it took 3 days for someone to finally ask if we were sisters. Usually we get that right away. (Fun fact: our mothers are the only two people who don't think we could pass ourselves off as sisters.) This was interesting for me because at one point in my life I had considered being a teacher for about 30 seconds in University. It was really interesting for me to learn some of the hoops these teachers have to jump through just to be allowed to take their students on a trip at all, let alone to Europe. I was confronted with my own European bias. I don't consider living here unsafe even after Paris, Belgium, Istanbul, Frankfurt. But to a parent sending their kid off for a week with their peers and a teacher...yeah Europe can be a scary place. I'm going mention this right now. Jamie is the only reason I didn't just totally lose it during the group travel thing. I've never done a group tour. I've never done the "look at all these important things while we drive by quickly because we have something to get to where you will get a whopping 25 minutes because we're loaded back on the bus and taken some where else. "And you don't know it's not your thing unless you actually do one of these tours. So needless to say group tours are not my thing. That being said, the tour meant I got to spend 4 days with my bestie so I was on my absolute best behavior...most of the time. I'll be honest, sometimes I can't help the sarcasm that comes out of my mouth. It just happens. At least I have the ability to control my volume. We started in Split and ended in Dubrovnik. Which we were informed by our guide Nikola was a jewel of Europe. Yes, both city. We quickly learned that according to our guide there were a lot of jewels of Europe, a bunch of gems. Some were even gems in the crown of Europe and I think there was even a couple of things that were nestled in the heart of Europe though clearly not jewel quality. Our trip consisted of hiking, a boat ride, a lot of ancient stuff, wine...lots of it, getting on and off a bus, swimming in a waterfall, spending 45 minutes in Bosnia and Herzegovina, being on a pirate ship, realizing that Croatia is Game of Thrones mad, learning that saying "What's a Khaleesi?" really loud in front of game of thrones fans is super fun, making a breakfast sandwich out of the breakfast buffet at the hotel is awesome. We climbed stairs, walked through churches, saw the supposed swaddling clothing of Jesus, looked in the window of one of the worlds oldest pharmacies (the third oldest I think...) We rode in a cable car, refilled water bottles in fountains and watched a young Italian man try to drink a Guinness without making a face. We laughed. We stayed up late. People watched. Saw gems and jewels and things that we needed to prepare ourselves for and things that we were told were going to be legendary. We drank wine on a bus. Guinness in an alley. Beer on a pirate ship that was used in an episode of Game of Thrones. And cocktails on a veranda watching the sun set. We swan in the Adriatic. Walked and walked and walked. I helped her find all the shark things for my Godson and she helped me find the tackiest salt and pepper shaker known to man. Oh and we bought matching dresses...as one does when they are let loose with their best friend in a new foreign countrys. We basked in air conditioning when given the chance and wore ridiculous tshirts. We discovered a beautiful new country and best of all we go to it together.